Based in The Philippines. Giovanni is a Sagada-born Kankana-ey Igorot from the Mountain Province in the Cordillera Region of Northern Luzon, Philippines. He studied political science and law, and earned a Master’s Degree in Urban and Regional Planning at the premier state University of the Philippines. He has recently been selected to represent the Asia Region as a member of the Global Environment Facility-Indigenous Peoples Advisory Group (GEF-IPAG). Giovanni directed the Presidential Task Force on Indigenous Peoples in 2000-2001, and was Manager for Business Development of a major steel company for a number of years before dedicating himself entirely to defending the rights of indigenous peoples. 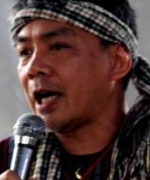 Since 2009, he has been Secretary-General of the National Coalition of Indigenous Peoples in the Philippines (KASAPI Inc), which is a Member of the Consortium. He convened the founding congress of the Philippine ICCA Consortium (Bukluran ng mga Katutubo Para sa Pangangalaga ng Kalikasan ng Pilipinas), which also became a Member of the Consortium. At present, Giovanni is engaged in a major GEF initiative focusing on the appropriate recognition and support of ICCAs in the Philippines.